With 30+ years in the trade Kitchen-Fitter offer great services, a business that likes to use local products to transform your kitchens. Our aim is to leave you completely satisfied with high quality work at a reasonable price carried out by experienced tradesmen certified to carry out the works required. We're a team of experienced local tradesmen who take pride in the jobs we do. Fitting a kitchen or a bathroom well takes team work, experience and care. It's very much in our interests to do a good job every time as it is you we rely on to recommend us to others. 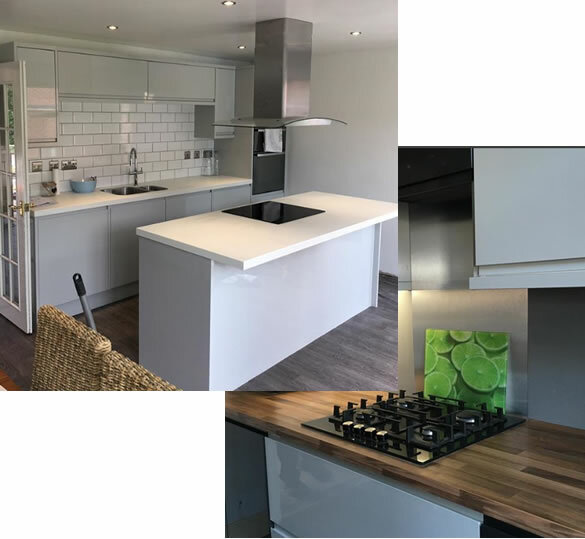 We organise and carry out large and small kitchen projects, from simply renewing your old kitchen sink to planning, supplying, installing, gas and electrical work, and wall and floor tiling of your new kitchen. Each kitchen is personally managed by the business owner himself. The kitchen and bathroom range we supply is of a very high quality at very reasonable prices Contact us to Book a free no obligation survey today.. If you would like to book a FREE no obligation survey for a new bathroom, kitchen or carpentry work then please get in touch with us today. You can contact us via telephone or if you would prefer for us to call you please fill out our enquiry form and one of our team will be in touch within 48 hours. If you see products that you would like to discuss with us please feel free to send the link to the page via email to us.